We are asked everyday, what is the best way to clean a barbecue grill? The answer will vary slightly depending on the grill and how dirty it truly is. Regardless, you will want to maintain a clean grill so that you may prevent flare-ups, get more even cooking temperatures, and extend the life of your cooking grates and grill components. Here are some tips that we have compiled, followed by a helpful video from Weber regarding how to clean one of their gas grills! Exterior of grill: Wash with a solution of warm soapy water and a non-abrasive scrub pad or soft sponge. An all purpose degreaser or grill cleaner will work in this case as well. Stainless steel surfaces should be cleaned with a stainless steel cleaner, being sure to always wipe in the direction of the grain as to prevent scratches. Interior of grill: A plastic putty knife will be your best friend here! With the putty knife, you will want to scrap the insides of the cook box, allowing the grease and grime to fall down into the catch pan below. You may use warm soapy water, or an all purpose cleaner/degreaser of your choice to wipe down the surfaces. The key here is to get rid of grease that might have accumulated. By doing so, hot grease will not catch fire and cause a flare-up. Cooking grates: Our cooking grates probably show the most wear. To remove the large baked-on food and grease, you will want to preheat the grill for about 5-10 minutes and use a good stainless steel grill brush to knock off the large mess. If this isn’t enough to clean them entirely, then you will want to let the grill cool down and remove the grates. Bring them inside, where you may soak them in your sink with a soapy solution or use a grill grate cleaner such as those from Goo Gone or Weber. 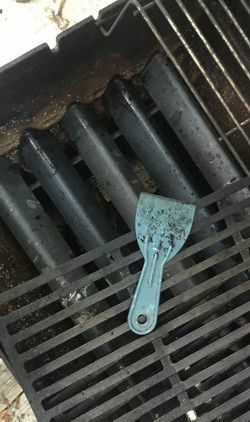 If the cooking grates are really dirty, you may choose to use ammonia to clean them. Simply place the cooking grates inside a black plastic bag and allow it to bake in the sun for a day. Once removed, the dirt will be loosened up entirely and can then be hosed off. For step by step instructions, please visit this page on ApartmentTherapy. Flavorizer bars: Like the cooking grates, heavy messes on Flavorizer bars can cause hot grease to puddle and flare-up. Build-ups can also lead to corrosion of the bars over time, so it is very important to keep these bars clean. Weber calls them Flavorizer bars, but they are the bars/panels that sit below the cooking grates and protect drippings from falling directly on the burners. Burner tubes: Simply brush the burner tubes clean with a grill brush. You will want to brush them in the opposite direction of the direction that they run, so as to push dirt away from the holes instead of back in. Catch/grease pan: Scrap catch pan free of build-ups with a putty knife. Use soap and water if you desire. Never line the catch pan with aluminum foil. Empty the grease pan if full of drippings. Thanks for reading everyone, and happy grilling!